One of the most common sources of water damage in a home is the dishwasher that you rely on daily in your kitchen. There are a number of important steps that you should be taking to help prevent water damage sustained from these types of appliances. One of the first things that you need to keep in mind to make sure that you do not go through water damage from a dishwasher is the cycle at which you replace your appliances. As a general rule of thumb, you should always replace your dishwasher every three to five years. That may seem like a short amount of time and a large amount of money to spend, but the shell of the dishwasher can form hairline fractures over time just from routine use alone. Hard water and soap residue can build up, causing these fractures. Those fractures will only get larger and larger, which will result in thousands of dollars of water damage if you are not careful. On the years when you are not replacing your dishwasher, you need to make sure that you have the drain line and supply line inspected for both leaks and cracks every year. These components will also wear naturally through routine use, which can quickly get out of hand if you aren’t proactive about monitoring them. Along the same lines, you should also make a habit of ensuring that the drain line is correctly hooked up to the sink. The drain line should be tightly connected to the plumbing under your sink and should not be loose in any way. If it is, the natural water pressure from the dishwasher will continue to wear at the connection between the two components and could dump an entire dishwasher’s worth of water into your kitchen. Another preventative measure would be to only run the dishwasher when you are home so that you can guarantee you will catch any leaks immediately as they occur. If you turn on the dishwasher and leave the home, a leak could develop during the cycle and water damage might only occur 20 or 30 minutes later. If you are home, you can shut off the dishwasher and disconnect the water line right away. If you are not, water will continue to pour into your kitchen with no end in sight. You should also keep an eye out for warping or buckling on the floor in the area of your kitchen immediately surrounding the dishwasher. This is especially true if you have hardwood floors. If you have carpeting, make sure that you’re watching out for wet or damp patches. This is a sure sign that your dishwasher has a leak and that you have an issue that should be investigated by a professional as quickly as possible. If you live in a home with a basement level immediately below your kitchen, you should also continually monitor the ceiling in that area for any water staining and other signs of distress. This is a sign that there is a leak, though the extent of which will not necessarily be clear until you employ the services of a professional to come check it out. There is still time for you to fix a small problem before it turns into a much larger and more expensive one. Finally, you should always make sure that you are not improperly filling your dishwasher. 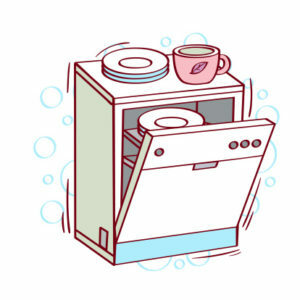 Doing so will cause water during the dishwasher’s cycle to move in ways that it should not necessarily be moving, which would exacerbate small problems at the same time.